BB30 BB for 24mm cranks with ABEC 3 bearings. Delrin housing. BB30 BB for GXP cranks with ABEC 3 bearings. Delrin housing. BB30 BB for 24mm cranks with angle contact ABEC 5 bearings. Delrin housing. BB386 BB for 24mm cranks with ABEC 3 bearings. Delrin housing. BB386 BB for GXP cranks with ABEC 3 bearings. Delrin housing. BB386 BB for 24mm cranks with ABEC 5 angle contact bearings. Delrin housing. BB386 BB for GXP cranks with ABEC 5 angle contact bearings. Delrin housing. BB92 BB with angle contact ABEC 5 bearings. Delrin housing. PF30 BB for 24mm cranks with ABEC 3 bearings. Delrin housing. PF30 BB for GXP cranks with ABEC 3 bearings. Delrin housing. PF30 BB for 24mm cranks with angle contact ABEC 5 bearings. Delrin housing. PF30 BB for GXP cranks with angle contact ABEC 5 bearings. Delrin housing. PF30 BB with angle contact ABEC 5 bearings. Delrin housing. Complete PressFit BB30 with Enduro Zero Ceramic Hybrid Bearings. Complete PressFit BB30 with Enduro Ceramic Hybrid Grade 5 Bearings. The bearings for the XD-15 are made from nitrogen steel milled from the south of France. This steel uses nitrogen instead of carbon as most steels use. The nitrogen allows for a more homogeneous grain structure. This more consistent grain structure makes the races smoother and longer wearing. As nitrogen steel is inherently stainless, it also offers the highest level of corrosion protection. The nitrogen steel we use in the XD-15 bottom bracket is used in jet turbines of Airbus aircraft. 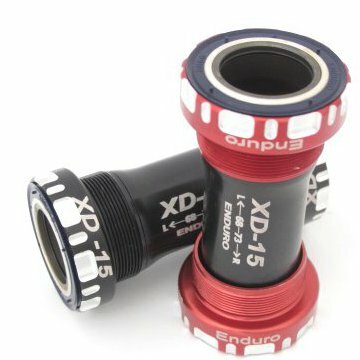 We could have stopped there but decided to go even further with the XD-15 bottom bracket design. We chose to make the bearings angular contact. Traditional bottom brackets use radial bearings. Unfortunately, radial bearings have a hard time dealing with lateral loads that come with using external BB cranks. The newer crank designs can put unwanted side load on the bearings causing increase friction and wear. 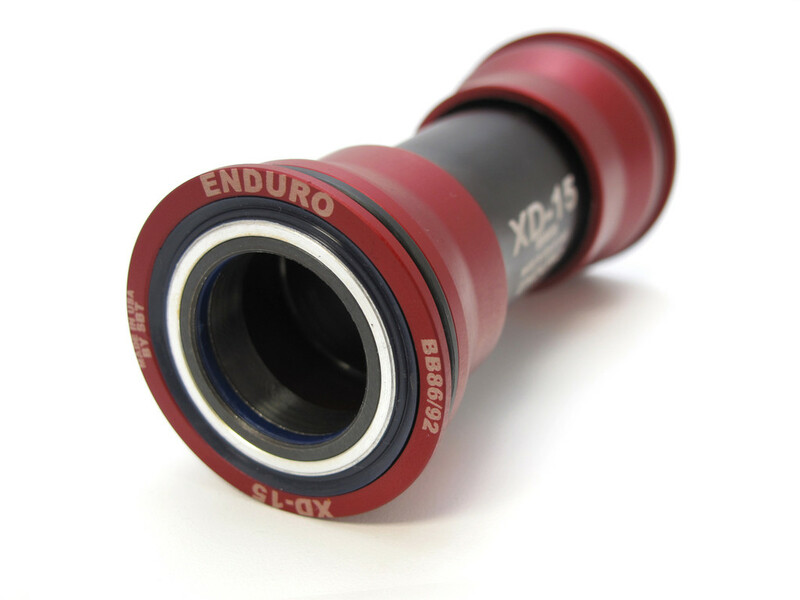 The XD-15 bottom bracket eliminates the problem and the bottom bracket runs smoothly even with side load. This makes the bottom bracket a lot more robust to variations in installations. 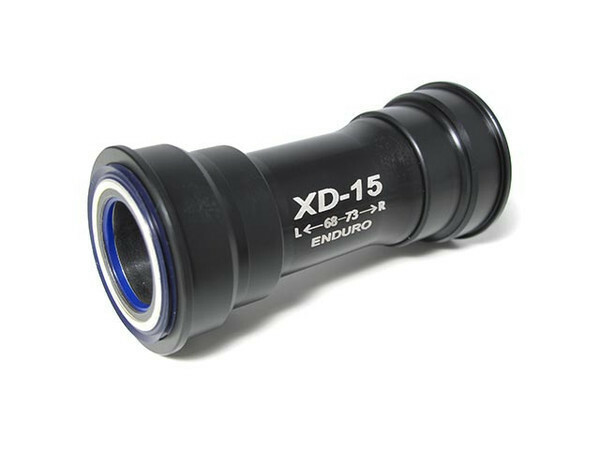 XD-15 bottom brackets come with a one year guarantee against wearing out or defects. That means you can ride them to your hearts content in rain and muck and not have to worry - they are that tough! Allows the use of 24mm cranks in BB30 frames. Allows the use of GXP cranks in BB30 frames. XBBB30EXA3 - Enduro External BB30 cups and ABEC 3 bearings. Allows the use of SRAM/Truvativ GXP cranks in BBright frames eg Cervelo. Allows the use of 24mm cranks (Shimano etc) in BBright frames eg Cervelo. These adaptors install into existing BBRight BB. If a BB is required the Wheels Mfg PF30 with Angle Contact bearings is the best match. 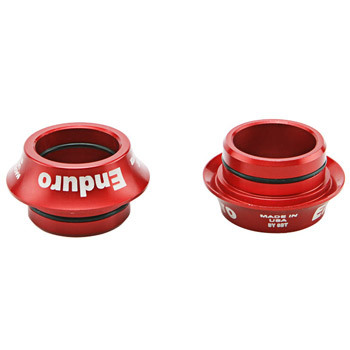 External cups to run 30mm cranksets 386EVO, Rotor in std threaded bottom bracket shells. 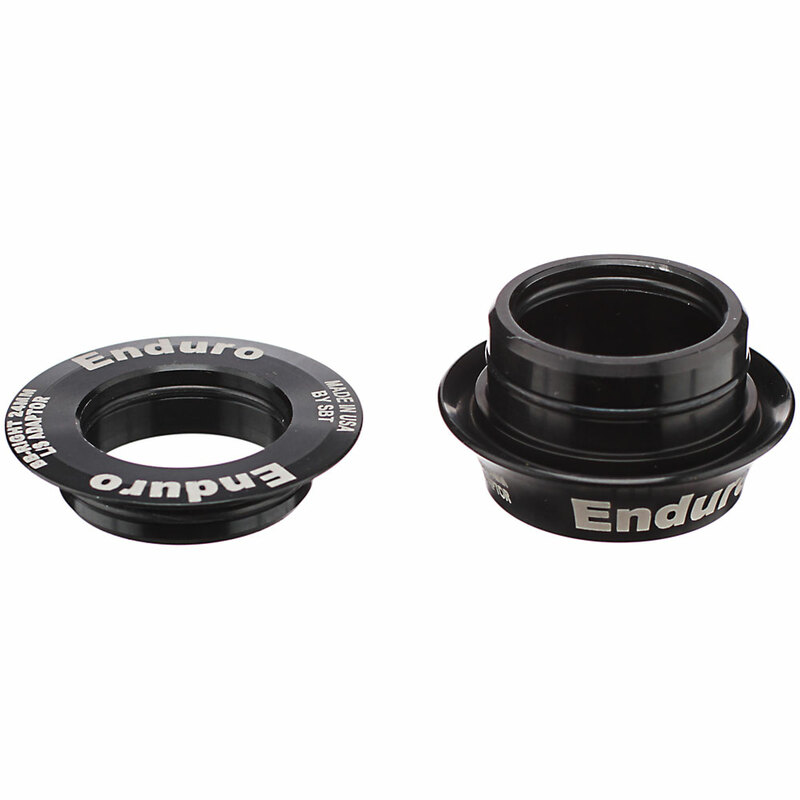 External cups to run 30mm cranksets by Clavicular and Zipp in std threaded bottom bracket shells. ZERO Ceramic Hybrid bearings and outer seals. Grade 5 Ceramic Hybrid bearings and outer seals. Note: There is only ~07 mm difference between the crankshaft sizes of the FSA variant. However because our bearings sit directly on the crank this makes it impossible to correctly fit our standard BB upgrade bearings. it is important to be able to determine which size FSA crankshaft you have before ordering. Please contact your bike shop or us to ensure you get the right kit. Enduro stainless steel angualr contact bearings and outer seals. Enduro stainless steel angular contact bearings and outer seals. 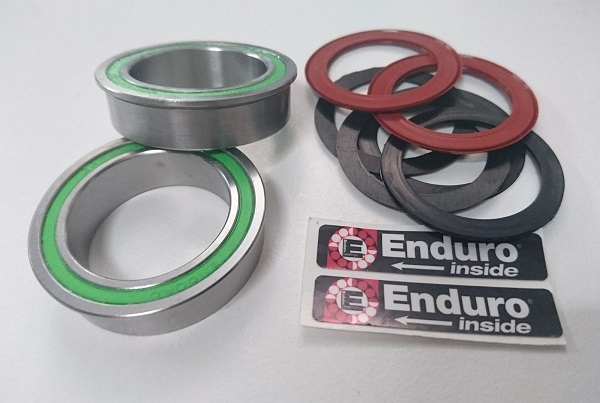 Enduro bearings and outer seals. 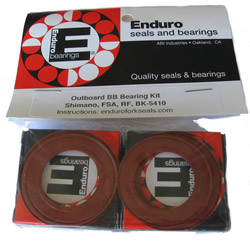 Add this to one of our Outboard bearing BB sets and you can use them for your SRAM/Truvativ GXP type cranksets. Machined Delrin housings. Fitted with ZERO bearings. Suits 24mm cranks like Shimano Raceface etc. Requires the Truvativ/SRAM seal/shim kit for GXP cranks. Includes the lightweight bearing shields and optional seals.